A private swimming pool and covered outdoor living room are highlights of our Palm Villa. 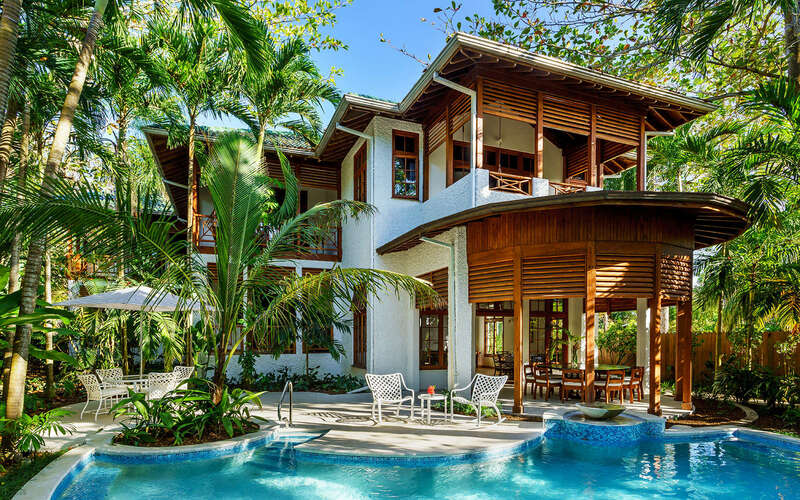 Featuring five bedrooms with king bed, en suite bathrooms and private veranda, this two-story oceanfront villa has a fully equipped kitchen, living room, dining area and powder room. Children under 12 are free when sharing with adults (ID required for children two and up). Babysitting services can be provided upon request as an additional charge. $60 per additional person over summer. $70 per additional person over winter. Each villa is fully staffed with a private Chef, personal butler/bartender and housekeeper. Mornings begin with a visit from the concierge, who will check-in to make arrangements for shopping, activities and off-site excursions. Your personal Chef will delight you throughout the day with freshly prepared meals, while your butler/bartender will keep your drinks fresh all day, whether you are by the pool or wading in the ocean surf. $65 per child between the ages 5 and 12. No charge for children under the age of five.